Rhyl Athletic F.C. win three Cups! The season of 1923-4 was a very successful one for Rhyl Athletic Football Club. 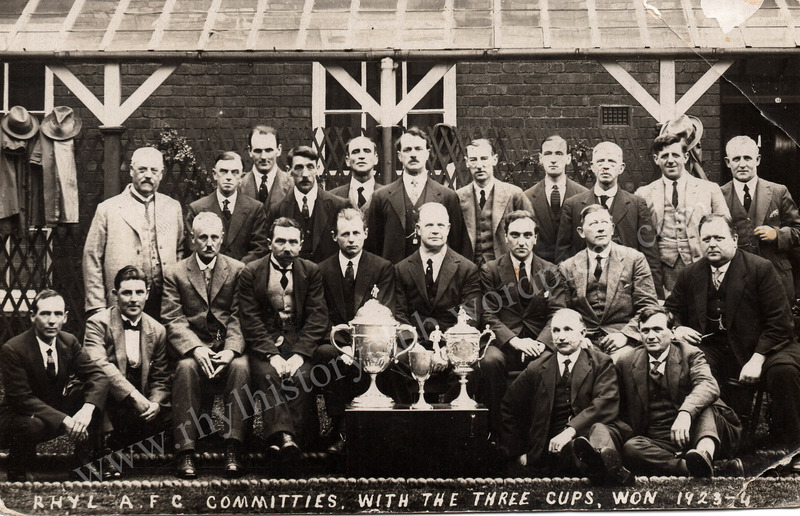 In terms of the Welsh League their performance was moderate only, however for the first time in its history the Club won three cups in one season. Photograph taken at Rhyl’s Belle Vue Football Ground at the Grange Road or “popular” end. The Vale of Clwyd League Challenge Cup was the first to be won. The Cup and medals were won when Rhyl’s second team triumphed over Abergele by six clear goals at the final at St. Asaph. The Welsh National League Challenge Cup was the next Cup to be won. The senior eleven beat Druids 2-0 in the final at Llandudno. To reach the final Rhyl had beaten Denbigh 1-0 at Rhyl, Llanberis 4-0 at Rhyl, Llandudno 2-0 at Llandudno, and Bangor 1-0 at Colwyn Bay. The third Cup in which Rhyl were successful was the North Wales Charity Cup, previously known as the Soames Cup. In the final Rhyl overcame a strong Shrewsbury eleven to win by four goals to two. To reach the final Rhyl had again beaten Denbigh, Bangor and also Mold.